She seems to be a bit of a jerk, no doubt about it. But let’s keep things in perspective. She didn’t dump beer on his head, throw batteries at him, or light any cars on fire. There are worse fans. Perfect couple though, right? Look at that dude with her. Good grief. Also, do less, security guy… if that’s possible. *UPDATE* : HOLY CRAP, SHE’S BEEN IDENTIFIED, AND SHE’S INSANE. CRAZIER THAN YOU CAN IMAGINE. LIKE, BEEN ACCUSED OF MURDER CRAZY. READ. 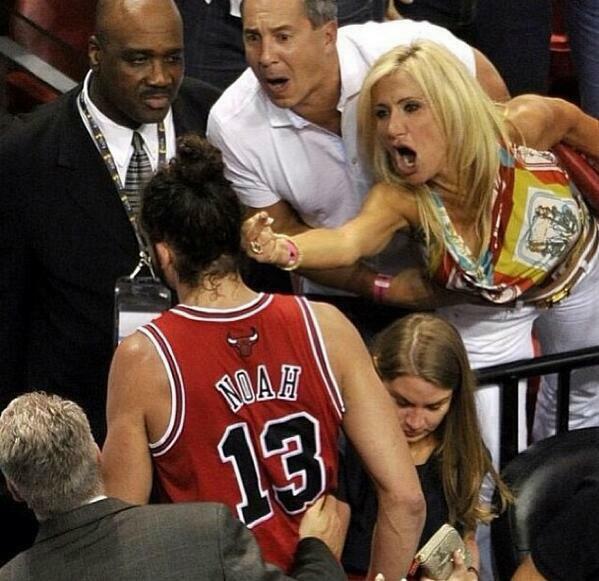 This entry was posted in Basketball and tagged heat fan, heat fan flipping off joakim noah, Joakim Noah. Bookmark the permalink.